What Is Your Flappy Bird Score? Because "what's your sign" is so last year. 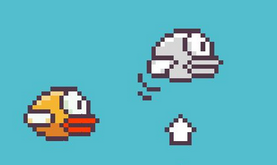 Flappy Bird is so ridiculously popular that you could ask a random person on the street whether he or she plays the free mobile game and there's a good chance "yes" will be the answer, which ultimately begs the question, "what's your Flappy Bird high score?" We currently have 134, while another person has 185. Most people joke about scores of two. We'd like to think these Flappy Bird tips would prove useful to them. On that note, let us know your Flappy Bird score. No judgment. We won't hurl pies your way, or send bad Internet vibes. We're all gamers here, and if anything, competition is always a great thing. No hacking, of course. If you don't play Flappy Bird, give it a try for iPhone & iPad or Android.